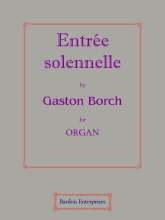 Borch, Gaston Louis Christopher. Studied in Sweden; in Paris with Jules Massenet; at the Svendsen, Copenhagen, under Johan Svendsen. Conductor in Christiania and Bergen, Norway, 1893-98; of the Pittsburgh Symphony Orchestra, Pennsylvania, U.S.A.; the Boston Opera House, Massachusetts; cellist. Composed an opera, orchestral pieces, piano, violin, and cello pieces, organ music, &c. b. Guines, Pas-de-Calais, France, Mar. 8th, 1871; d. Stockholm, Sweden, Feb. 14th, 1926.